Parksville, along with its neighbouring community of Qualicum Beach, is a picturesque little coastal town overlooking Georgia Strait and the Gulf Islands. It is an artist's colony, being home to painters, potters, weavers, sculptors and glass-blowers, all of whom welcome visitors to their studios. The town is also blessed with lovely beaches for saltwater swimming and is acclaimed for its sand castle competitions, as well as its street festivals, summer theatre and garden shows. Parksville sits surrounded by parks, both on the seashore such as Rathtrevor Beach Provincial Park, and in the rainforest, such as MacMillan Park with the famous stand of old-growth forest in Cathedral Grove, as well as the Unesco -designated ecological reserve, the Mount Arrowsmith Biosphere Reserve. Being centrally located on the east coast of Vancouver Island, it is well placed as a base for excursions to these areas, amenable to many activities and attractions such as sightseeing, golfing, scuba diving, hiking,fishing,caving, mountain-biking, and skiing. Rathtrevor Beach Provincial Park is a beachcomber's paradise as well as a superb swimming beach, with its large shallow shingle almost 2 kilometres long. It is home to many species of birds and seals approach the beach chasing the salmon so that bird- and wildlife- watching are common pastimes. Scuba-diving locations and amenities are also available. Rathtrevor Beach itself is just spectacular. When the tide is all the way out, you can barely see the ocean as the water line retreats almost a kilometre from shore. When the water returns, it is warmed by the sun heated sand and provides spectacular swimming opportunities for kids and adults alike. This beach is a location not to be missed. MacMillan Provincial Park is distinctive for walking trails through virgin coastal rainforest, typified by its stands of giant Douglas fir trees, some of which are 800 years old and some 30 feet in circumference, located in the famous Cathedral Grove. 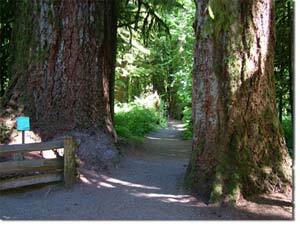 Other trails wend their way through groves of ancient Western Red Cedar. The park is located on Highway 4 on Cameron Lake, 20 miles west of Parksville. Englishman's River Falls Provincial Park and Little Qualicum Falls Provincial Park both feature walking trails in the rainforest, with spectacular scenic waterfalls with clear swimming holes and picnic areas. Home Lake Caves Provincial Park contains seven caves , tours of which are given by guides from the Canadian Cave Conservancy. French Creek, about 3 miles north of Parksville, is a popular fishing spot where visitors can cast a line from the dock at the French Creek Marina for the chance to hook a salmon.